Es wird eine neues MK-10-Aufwertungskit geben, welches 42000 Credits pro Anbringung kostet. 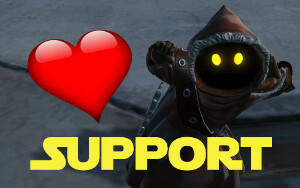 In dieser XML-Datei von swtor_potato findet ihr die neuen Fähigkeiten, Talente und Funktionen des Disziplin-Systems für alle Klassen. Sehr spannend! * 2 piece: Reduces the cooldown of Frenzy or Valorous Call by 15 seconds. Additionally, activating Berserk or Zen increases all damage dealt by 4% for 15 seconds. * 4 piece: Cloak of Pain or Rebuke heal you. * 6 piece: After using Force Camouflage your next successful attack will critically hit. * 4 Piece: Force Speed increases defense by 15% on yourself and 7 allies in a 10 meter area upon activation. * 6 Piece: Affliction or Weaken Mind damage has a 25% chance to reduce the cooldown of Recklessness or Force Potency by 3 seconds. * 2 Piece: Reduces cooldown of Innervate or Healing Trance by 1.5 seconds. * 4 Piece: Extrication or Rescue places a Static Barrier or Force Armor on the target even if the target already has the Deionized or Force-Imbalance effect. * 6 Piece: Heals you cast have a 10% chance of granting a proc that makes the next Dark Infusion or Deliverance place a Roaming Mend or Wandering Mend on the target on a 30 second rate limit. * 2 Piece: Heatseeker Missile and Thermal Detonator or Demolition Round and Assault Plastique increase surge by 5% for 15 seconds. Cannot occur more than once every 30 of seconds. * 4 Piece: Jet Boost or Concussion Charge increases defense by 15% on yourself and 7 allies in a 10 meter area upon activation. * 6 Piece: Unload and Blazing Bolts or Full Auto and Boltstorm increase alacrity by 10% for 10 seconds. Cannot occur more than once every 30 of seconds. * 2 Piece: Reduces the cooldown of Healing Scan or Advanced Medical Probe by 1.5 seconds and the cooldown of Emergency Scan or Bacta Infusion by 3 seconds. * 4 Piece: Chaff Flare or Diversion grants allies in the area an additional 5% increase to Critical Rating for 10 seconds. * 6 Piece: Heals you cast have a 10% chance of granting a proc that makes the next Rapid Scan or Medical Probe place a Kolto Shell or Trauma on the target on a 30 second rate limit. * 6 Piece: Oil Slick or Smoke Grenade has a 50% chance to finish the cooldown of Kolto Overload or Adrenaline Rushl. * 2 Piece: Flaming Fist and Magnetic Blast or Shockstrike and Tactical Surge increase surge by 5% for 15 seconds. Cannot occur more than once every 30 seconds. * 4 Piece: Energy Shield and Reactive Shield heal you for x. * 6 Piece: Grapple or Harpoon has a 50% chance to reset the cooldown of Explosive Fuel or Battle Focus. * 2 Piece: Furious Strike and Vengeful Slash or Concentrated Slice and Vigilant Slash increase critcal chance by 5% for 15 seconds. Cannot occur more than once every 30 of seconds. * 4 Piece: You are healed when your Saber Reflect deals damage. This effect cannot occur more than once per 0.5 seconds. * 6 Piece: Smash and Raging Burst or Force Sweep and Focused Burst increase surge by 10% for 10 seconds. Cannot occur more than once every 30 of seconds. * 2 Piece: While in Soresu Form, Force Choke or Force Lift grants 3 stacks of Revenge or Courage. * 6 Piece: Enraged Defense or Focused Defense has a 50% chance to finish the cooldown of Invincible or Warding Call. * 2 Piece: Reduces the cooldown of Target Acquired or Illegal Mods by 15 seconds, and activating either ability restores 15 energy. * 4 Piece: Leg Shot heals you for x. * 6 Piece After using Covered Escape or Hightail It your next successful attack will critically hit. * 2 Piece: Ball Lightning and Leeching Strike or Psychokinetic Blast and Serenity Strike increase surge by 5% for 15 seconds. Cannot occur more than once every 30 of seconds. * 4 Piece: While Phase Walk is active Damage Reduction is increased by 2%. * 6 Piece: After using Force Cloak your next successful attack will critically hit. * 2 Piece: Force Pull grants 4 Stacks of Dark Protection or Shadow Protection. * 6 Piece: Overcharge Saber or Battle Readiness has a 50% chance to finish the cooldown of Force Shroud or Resilience. * 2 Piece: Laceration and Corrosive Assault or Sucker Punch and Brutal Shots increase surge by 5% for 15 seconds. Cannot occur more than once every 30 seconds. * 4 Piece: Exfiltrate or Scamper increases defense by 15% on yourself and allies in a 10 meter area upon activation. * 6 Piece: After using Exfiltrate or Scamper your next successful attack will critically hit. * 2 Piece: Increases the critcal chance of Kolto Waves by 15%. * 4 Piece: Countermeasures or Surrender grants allies in the area an additional 5% increase to Critical Rating for 10 seconds. * 6 Piece: Heals you cast have a 10% chance of granting a proc that makes the next Kolto Injection or Underworld Medicine placing 2 Kolto Probes or Slow-release Medpac on the target on a 30 second rate limit.